The man regarded as the best mixed martial artist of all time has returned to a hero's welcome in Moscow. Hundreds of cheering fans greeted Fedor Emelianenko following his win over the previously undefeated Brett Rogers. Last Saturday, Fedor Emelianenko, considered the best pound-for-pound mixed martial artist on the planet, and probably in the history of the sport, knocked out Brett Rogers to claim the 31st win of his brilliant career. With millions all over the world watching and admiring the Last Emperor's bouts the hero himself, who lives in the small Russian town of Stary Oskol, is a rare guest in Moscow. But November 17 turned out to be a big day for all Fedor's fans, who finally had the chance to welcome him at the airport and even shake his hand. In person, Fedor's cut nose, which had his fan-base worried during the bout, is still prominent a week after fight night. Though the champion himself was not paying any attention to it during the fight. “I didn't care about that cut at all. The only thing that bothered me then was that they might have stopped the fight,” he says. And fair enough. It took Fedor's best to keep his precious champion's belt from falling to an opponent who came into the fight with a flawless 10-0 record. “Brett Rogers is definitely one of the top ten fighters I've ever fought with. Though I don't trust any ratings and do not want to rate my opponents. I just tried to do it all the way I planned to do with my coaches. And it worked. 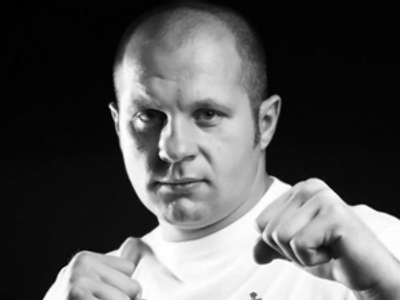 I kept the fight under control,” says Fedor. There's a wise old saying that it's much easier to get to the top than to stay there. To the delight of his fans, Fedor has managed to do both for a decade. “Thank God, I still feel well. We'll see what happens, but I would like to stay in the ring as long as it's possible,” he says. It’s obvious the champ has no intention of resting on his laurels, and that any future opponents will have a tough task prizing his precious belt from his hands.